This book is a must-read for any design enthusiast or anyone working in the design industry whether you’re practicing or collaborating. Mr Bierut writes with wit and delight while Abbott Miller reflects that in the design. He illustrates each essay with a new typeface that plays off the content of each piece. 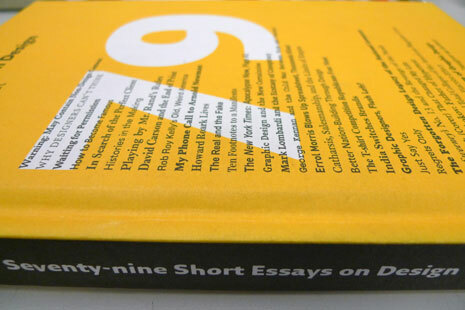 The book will bring you new insight into design and designers although not every essay will sing with everyone. Mr Bierut generously tells us stories from his early design days and mistakes I’m sure some of us would love to experience. Sadly, the times are changed and it’s not that easy to land your first job at Massimo Vignelli anymore. Despite the ever-changing times, Mr Bierut inspires us to reflect and rethink ourselves as we turn the pages to each new typeface. Another bonus is the essays are actually short, no problem if you can’t stay focused or don’t have time to in your busy schedule! Go online and order yourself a copy now because there’s a waiting list at the library.